Nope, you're not going to find a long list of medical supplies and medications. It really doesn't make any sense to duplicate the already expensive medical kit you should have on board your vessel (which list we shall save for another article). I'll include a few life raft specific observations which might impact your choice of supplies for that kit. The bottom line is that you only need one medical kit, but it should be packed in a waterproof container so it is suitable for use in a life raft -- and it needs to be stored where it will be accessible in an abandonment. Quite frankly, I believe all marine medical kits ought to be packed in waterproof containers with a desiccant included to ensure it is dry inside. 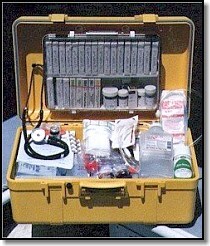 I'll never understand those who suggest using a toolbox as a self-assembled medical kit container. It's difficult enough to keep medical gear in good shape without dealing with the ever-present possibility of immersion. Adhesive bandages, even the best flexible fabric or foam ones, or those listed below, don't stick worth a damn when applied in wet conditions, unless properly prepped, and even then it isn't a sure thing. You can try using the widely available Tincture of Benzoin adhesive (available in single-use swabs-sticks) to get the bandages to stick better, but a better product is Mastisol adhesive (available in single-use crushable vials). Mastisol is less messy, sticks much better, and being insoluble in water, is best for raft use, but you may have to search for the vials or beg them off your doc. For really wet conditions you may have to rely on compresses with attached ties. So, make sure you include a large supply of 2 inch compresses to use instead of adhesive bandages when necessary. Duct tape can also be used to secure bandages. Life rafts are a veritable infection breeding ground. Small wounds you might otherwise ignore require aggressive action. Standard treatment is generally an OTC multiple antibiotic ointment or silver sulfadiazine cream (Silvadene). However, you'd do well to consider adding mupirocin calcium cream 2% (Bactroban), the most effective of currently available prescription topical anti-bacterial agents. It is also best to keep the wound dry, obviously a challenge in a raft. Transparent waterproof, but breathable adhesive bandages (3M "Clean Seals" and Curad "Aqua-Protect"), which are an outgrowth of products designed initially for surgical and hospital use ("Tegaderm" and "Biocclusive"), are now readily available. The thin clear protective material is flexible enough to work in most places without coming loose and it really seals the wound completely. Because they are clear, you can easily see any signs of infection developing at the edges of the pad, or with the surgical versions, around the closed wound. In some cases you may want to then cover this bandage with a compress to protect the thin material from abuse. Finally, all the medical supplies in the world won't do you a bit of good if you don't know how to use them properly. Take a course that focuses on the possible situation you'll have to deal with, which will vary considerably whether you are near to help or blue-water sailing. Once in the raft, sea sickness is very common. It doesn't matter that you never become sea sick, inside a tightly enclosed raft in heavy weather or moderate to high seas, you stand a very good chance of getting badly sea sick. Most survivors this editor has interviewed were either sea sick themselves or at least some of the other occupants of the raft were, which caused everyone additional problems. More than just an inconvenience or discomfort, it can be debilitating both physically and mentally, and even deadly in recorded cases. One of the problems with the small enclosed space of a life raft is that even if you aren't getting seasick yourself, if another survivor vomits in the raft, the smell alone can be enough to stimulate an adverse reaction and nausea. This is the reason why, typically, everyone in the raft gets sick soon after the first person does. One trick is to swab a small dab of Vicks Vapor Rub in everyone's nostrils, which effectively masks the smell. If you can't smell it, and better yet, can avoid looking at it, you will be more likely to avoid getting sick yourself. So, a small amount of Vicks packed in your kit can be a powerful deterrent to seasickness. Unfortunately, typical medicinal sea sickness remedies must be taken prior to getting sick to be effective, the only exception being a few prescription injectables and suppositries. That problem is compounded by the wide range of effectiveness of various drugs on the population -- results are highly individualized. What works for one may not for another and few seem to reliably work for a majority of people. If abandonment looks like it may become a viable option or necessity, it may be a good idea to take your chosen and proven anti-emetic well ahead of time. While most anti-emetic drugs make a majority of users drowsy, in an abandonment adrenaline will take care of that problem, guaranteed. Even if taken or applied soon after boarding, pills and the Transderm Scop patch may be too late, if it is anything but calm conditions and the onset of nausea is rapid, the typical situation. Still, it may be worth trying, as the alternative is seriously unpleasant. One solution that experience has been shown to often work even after sea sickness is already evident is the accupressure devices commonly marketed as "Sea Bands." These have relatively high efficacy for a significant minority of the population and are inexpensive, so well worth including. Another alternative that is the one of the few methods shown to work for the vast majority of users, even after the nausea has started, is the ReliefBand medical device (FDA approved for the relief of motion sickness and now available without a prescription) from Woodside Biomedical. This is an electronic device that works in much the same way as a TENS device works to block pain. 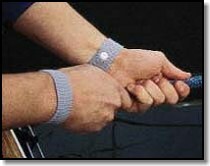 It is about the size of a wristwatch and is applied over that same accupressure point that is used for the Sea Bands. The personal experience of this editor and that of a number of testers confirms that the device works as claimed. While they do not yet offer a fully waterproof version, they have come out with a water-resistant "Adventurer" model that meets IEC529 standard IPX4, which in plain English means that it is splash resistant. In other words, not immersible, but more acceptable for use in a life raft than previous models. The Adventurer model is rated for 144 hours of use from a pair of CR-2025 lithium watch batteries. The battery life rating is at a medium intensity setting, which seems to work for most people. It will work effectively in damp conditions, though not when soaking wet (the electrodes short out). As such it would be fine in most cases inside a closed up life raft. You just have to be very careful not to forget it's on your wrist and perform some task that would soak it. Depending upon conditions, it may be a good idea to have some long-cuff 8 or 11 mil nitrile rubber gloves that can then be sealed with a rubber or Velcro band above the wrist. Nitrile gloves are fast replacing latex gloves in both medical and industrial use because they solve the latex allergy problems that many people have and more importantly for us, they are significantly more puncture and abrasion resistant. Enough so that they could stand up to the moderate abuse such as they might receive inside a life raft. After all, in heavy weather you're not going to be doing much except holding on. I should also note that to be useful it needs to be kept dry until you need it. Vacuum bagging the device or using a small waterproof container are options to consider. For one possible solution, click here for an example of what I did for a client. While a bit extreme becuase it was to be packed in a life raft, the concept is sound. 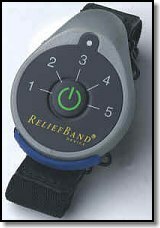 The Adventurer model ReliefBand runs about $150 at discount. That only sounds expensive to someone who hasn't already been there. Anyone who has ever been even a little sea sick would likely sell their soul for something that worked as effectively. NOTE: The Relief Band is available from ETS medical consultant Dr. Bent Blue via his Aeromedix.com medical technology company. Another remedy that I have found to be widely effective as well as generally effective after the nausea starts is Alta Labs' Motion Eaze, an herbal concoction that is applied topically behind the ear. It comes in a small thick glass dropper bottle, so it is essentially waterproof. However, it smells strongly as a result of the peppermint, lavender and other herbal extracts used, so vacuum packing is a good idea, just in case. Maintaining personal hygiene in a raft is difficult at best, but is very helpful for maintaining your health. Bearing in mind that fresh water will likely be scarce, self contained materials like cleansing towlettes or the like may be best. Salt water boils are a constant health threat, so being able to cleanse salt from your body would be an advantage. Dental hygiene should also be considered. Contact lenses and life rafts probably won't go too well together over the long term, but for the short term you should be OK. You should always pack eye glasses for a back-up (see below). For many who need them, losing or damaging their prescription eye glasses could be a virtual death sentence. Include a neck lanyard with each pair and pack carefully in a hard protective case, then vacuum bag. Be sure to rotate these drugs so they have not expired when needed. Some personal meds require refrigeration for extended storage. If so, be sure to include retrieval of these drugs from the ice box/refer a part of your abandon ship drill. In such circumstances, be sure to keep them ready to go at all times. You likely won't have time to gather them up at your leisure. They need to be kept in an appropriate container, equipped with a lanyard and clip, so all you have to do is grab them and go. Some drugs lose potency fairly quickly if not kept refrigerated, so you should discuss this with your doctor or pharmacist to develop a strategy for after they have been removed to the raft. It may be beneficial to consider some means to safely and securely submerge these meds in the water where temps may well be much lower in warmer climates. Photocopies of your and the crew's drivers license and/or passport, next of kin, etc. Out of the country you need to carry more and better I.D. How much is enough? From $50 to $100 in small bills will usually suffice. A duplicate or spare credit card could come in handy, as might a letter of credit from your bank. A phone credit card could also prove useful. © 1999, 2000, 2001 Douglas S. Ritter & Equipped To Survive Foundation, Inc.